Recover files from the entire disk in few easy steps. Deleted files or experienced a hard drive failure? Can’t access a disk or memory card? Desperate to get your files back and considering a data recovery service? Save time and money and perform the recovery yourself! You are perfectly able to handle the job when armed with a proper tool. Disk Recovery Wizard makes it simple to everyone and their mom to recover data from corrupted hard drives and restoring information from damaged disks and partitions even if Windows can’t see or access them! It’s been easy since we introduced the tool, but became even easier with the last iteration of the product. All you have to do to recover your disk and data completely is pointing a finger at the corrupted device, and clicking “Next”! Disk Recovery Wizard makes the complex process of disk recovery appear extremely simple to you, the user. No matter what version of Windows you were using and what file system (FAT or NTFS) your disk had, Disk Recovery Wizard will carefully scan the damaged drive to locate all partitions and recover your files and data. Anyone who “guarantees” data recovery is not telling the whole truth. Sorry if that’s not what you wanted to hear. Yet, with Disk Recovery Wizard we come darn close to giving you a 100% guarantee! Scan the disk and click on any file. If you see a preview of that file – yes, we’ll guarantee that this particular file is fully, completely, 100% recoverable! With support for more than 250 formats, Live Preview is more than just a preview. It has become a powerful data recovery tool helping you decide what’s recoverable and what you want to recover. Our signature Live Preview feature works even in the free edition. The Disk Recovery Wizard implementation of Live Preview not only displays a full-size preview of documents, pictures, archives and multimedia files, but does it carefully enough not to do any damage to the original file or disk. Live Preview does not write anything onto the damaged disk, or any disk if that matters; instead, it stores the recoverable file in the computer’s RAM memory. While Live Preview is no snake oil, it does guarantee successful recovery provided that you see the preview. Can I Fix Inaccessible Disks? Of course! Disk Recovery Wizard only seems simple, but features complex disk recovery technologies under the hood that took us years to perfect. If you want technical jargon, click here for the complete list of advanced Disk Recovery Features. Can I Recover SSD drives and Memory Cards? Yes. 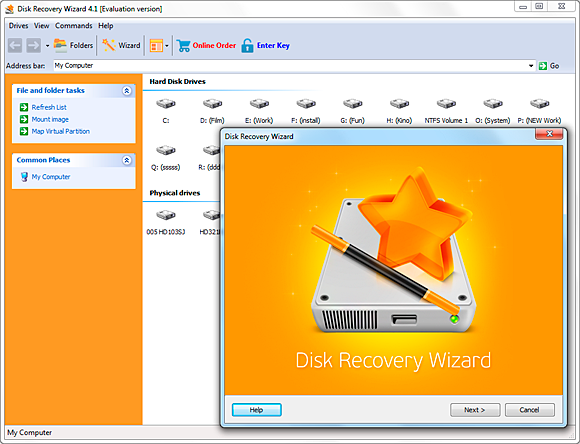 Disk Recovery Wizard recovers files and data from just about any type of storage media. Hard disks are supported along with all types of flash memory cards, including, but not limited to, SD, MMC, CompactFlash, SONY Memory Stick, xD, USB dongles, external hard drives, and even digital cameras connected via USB! And yes, SSD drives are also supported – as long as your data is still there, we’ll recover it with no sweat. Undeleting freshly deleted files is an easy task for tool much simpler than Disk Recovery Wizard, but we just can’t work hands down! Unlike the free ‘undelete’ tools you may find floating over the net, Disk Recovery Wizard does not limit its search for deleted files with the file system. Instead, it scans your entire hard drive or memory card sector by sector to locate every file that could possibly be recovered. The proprietary PowerSearch technology uses antivirus-like scanner engine to discover a variety of popular document, archive and picture formats, allowing you to save files that were lost ages ago!